At some point last year, my friend and 61 Local colleague Laura and I were at work, whiling away a slow shift by discussing dinner clubs. 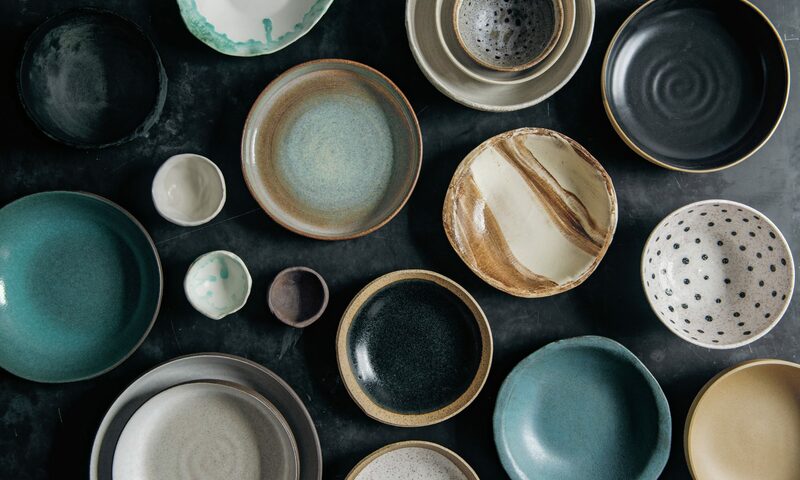 We came up with the idea for one that focuses on a curated selection of ingredients, where each 6-course dinner would have an ingredient spotlight, and then each course would have to use it in some interesting way. As we explored the possibilities, we decided that we needed to see this dinner club realized. Laura and I picked the ingredients—olive oil, honey, ginger, miso, mint, and orange—and I assembled our cooks and diners: Camila, Colin, Matthew, Laura, Nozlee, and me. Dinner clubs are always fun for someone who likes to cook, eat, and linger over a dining table talking about food. But this one has been so much fun—so exciting, due in part to getting a great balance of food-curious people who are largely new to each other, but also because of all of the creative and delicious dishes that we’ve tasted. A few highlights: For our olive oil dinner, Nozlee made martinis that featured olive oil-infused vermouth. For her ginger appetizer, Laura made ginger-scented meringues stuffed with gingery, curried blue cheese. And at this most recent dinner Colin made a miso-banana ice cream, flavored with kecap manis, the sweet, thick Indonesian soy sauce. This last dinner, which featured miso, was a bizarre and incongruous meal, but it was a resounding success. We had “miso fashioned” cocktails, a spin on an Old Fashioned made with a miso syrup, whiskey, and chamomile-citrus bitters; a corn and miso bisque drizzled with miso butter; “sea-sar” salad, a spin on a Caesar salad made from seaweed, with dehydrated miso subbing in as the parmesan crumbled over the top; miso-marinated mushroom and steak tacos with a spicy slaw; and then the aforementioned ice cream. 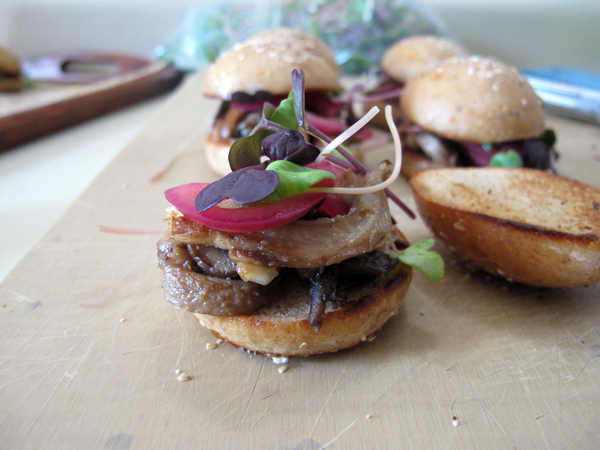 My contribution was the appetizer, miso-mushroom sliders. This was perhaps the least inventive in the context of this dinner club, but it was rich, juicy, and satisfying, and generated enough excitement that I thought readers here might want to give them a whirl. Miso and honey are a wonderful combination, but these were good also because I used a great medley of mushrooms. I picked up some shiitakes, criminis, and yellow oyster mushrooms from Madura Farms’ stand at the famers market near me—they were dainty and expensive, but so delicate and fresh, almost floral in their fragrance. I took care cooking them, searing each variety separately and in small batches, allowing them to caramelize but not to overcook; I wanted them succulent, which helped to retain their individual flavors. I also made my own little slider rolls, which were adorable and infused, of course, with the requisite miso (I’ve omitted that part in the recipe below, as it was more impressive in theory than execution). All in all, it was a very fun way to kick off a meal, and it seems like the sort of thing that would work well in a passed hors d’oeuvre setting or as part of a finger foods spread. With upcoming graduations, mothers days, fathers days and all the other reasons to celebrate the warm weather ahead, hopefully you’ll find an occasion to have as much fun with them as I did. A good selection of mushrooms is crucial here. Try to use at least three different kinds. And if you’re a strict vegetarian, make sure to check the ingredients of your miso carefully—some of them contain bonito, which is dried fish flakes. 1. 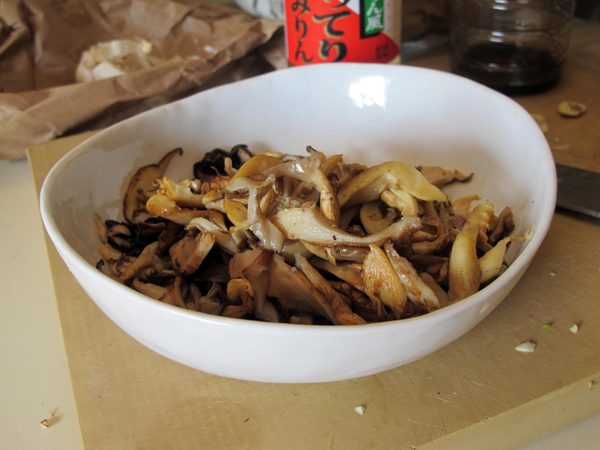 Discard the stems of tough-stemmed mushrooms like shitakes, and slice the caps very thinly. For delicate mushrooms, like oyster mushrooms, gently separate the small lobes apart from the main stalk and thinly slice the large ones; slice the stalks, if meaty and tender, into very thin pieces. Slice button and crimini mushrooms very thinly (I don’t separate the stems of these types of mushrooms—I eat them). 2. Heat about 2 tablespoons oil in a skillet over high heat. Cook each mushroom variety separately—and in batches if necessary to avoid crowding—without stirring too much so that they develop some caramelization. Cook until just tender and juicy, less than 5 minutes. Transfer to a plate. Add additional oil to the pan as needed for subsequent batches. 3. Meanwhile, whisk together the miso, mirin, soy sauce, and water in a small bowl. 4. After you finish cooking the mushrooms, return the skillet to the heat, add a splash of oil and then the garlic. When fragrant, pour in the miso mixture, scraping the pan with a wooden spoon to dislodge any browned bits. Just as it appears to thicken, add the mushrooms and the honey. Cook for a minute or two, until evenly coated and the sauce clings thickly to the mushrooms. Keep warm, or let cool and reheat before assembling the sliders. 6. To serve, divide the mushrooms over the bottom halves of the buns. Top with a few pickled onions, a little pile of greens, and close up with the top halves (which have been spread with a bit of mayonnaise if desired). Spear with a long toothpick if you’d like. The sliders are best served warm. 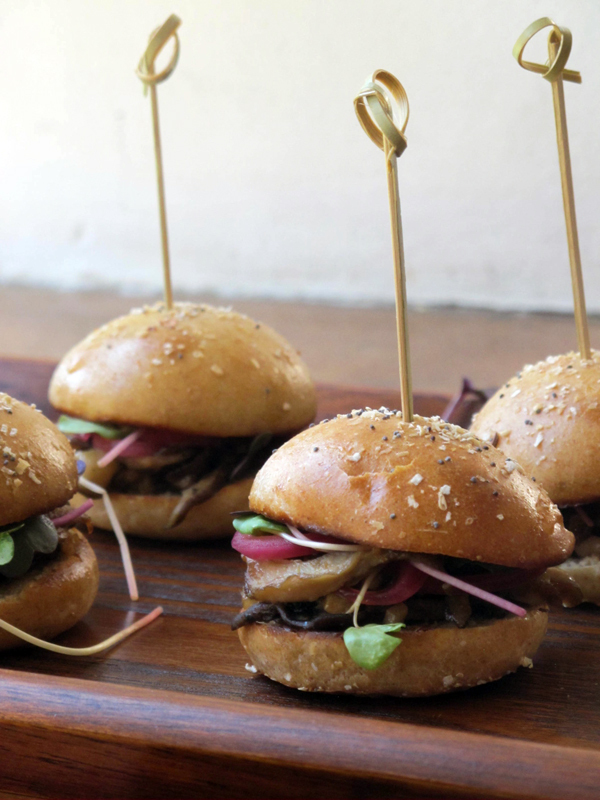 You can certainly use whatever recipe you like for the buns, and the vegan bun recipe in Veggie Burgers Every Which Way also makes excellent slider rolls. Whatever recipe you use, just follow the shaping recipes below. If you don’t feel like making your own rolls, consider calling your local bakery—they’ll probably be able to customize a few dozen for you. 1. Combine the water, 1/4 cup of the milk, and honey in a small saucepan and heat until just warm over medium-low heat—it should only take a minute or two. Sprinkle the yeast over the top and let stand for a few minutes until foamy. 2. Meanwhile, combine the flours and salt in a stand mixer. Add the butter and mix at medium-low speed, using the paddle attachment, until incorporated. Pour in the warm liquids and 1 of the eggs, which should be lightly beaten first. Mix with the paddle attachment until combined, then switch to the dough hook and knead for about 5 minutes, until the dough is soft and elastic, pulling from the sides of the bowl but clinging to the base. Add more flour by the tablespoon if the dough seems too wet, but opt for a sticky dough over a wet one—too much flour will make the buns dense. 4. 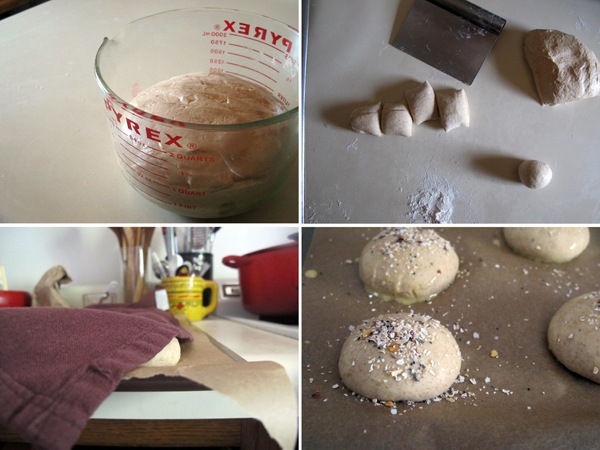 To shape the buns, divide the dough into 4 pieces. Roll each one into a log about an inch and a half in diameter, then divide each log into 4 or 5 pieces. Shape them into ping-pong sized balls by rolling each piece of dough between your hands or against the counter, cupping your hand over it and working it in a circular motion. The dough should still be fairly chilled, which will make it easier to work with and unlikely to stick much, but if it is sticky, lightly flour your work surface and your hands as needed. 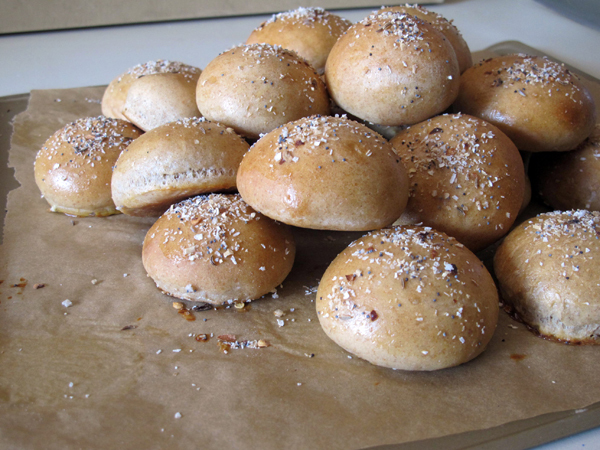 Repeat with remaining dough, arranging the buns on two parchment-lined baking sheets. Cover with a clean towel or pieces of plastic wrap and let stand in a warm place to rise until doubled in size, which will take 1-1/2 to 2-1/2 hours. 5. Preheat the oven to 400 degrees Fahrenheit. 6. Whisk together remaining egg and 1 tablespoon milk in a small bowl. Brush the egg wash over the buns, then sprinkle with your adornments of choice. Bake for 15 to 20 minutes, until golden on the tops and bottoms. Cool completely. These were so good. You modestly forgot to mention that we DEMANDED that you make us all a second slider! Son. In my next life I’m coming back as a gay man who can (among other things) cook. Damn. Lucas! Give us the recipe for ginger-scented meringues stuffed with gingery, curried blue cheese – dear Lord! And would love some more how-to videos… Thanks for all of this!